The Philadelphia Zoo Safari Monorail is billed as the first zoo monorail at America's first zoo. The system was installed in 1969 by Universal Design Limited, and is similar to the monorail system that ran at HemisFair in San Antonio, Texas and the one still in operation at Geauga Lake Park [now Six Flags Over Ohio] in Aurora, Ohio. To my knowledge, the Ohio system is the only one of this type of monorail to enjoy accident free service. More on that later. 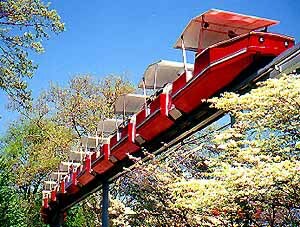 Other UDL monorails in this county run at Dutch Wonderland [two of their original UDL trains have been replaced], Riverside Park [dismantled since this article first appeared in MONORAIL newsletter], and the State Fair of Oklahoma. While most UDL systems run on steel track, the Riverside monorail's beam is partly wood, while the Oklahoma system enjoys the distinction of being the only concrete tracked UDL monorail in existence. You may recall from my coverage of Dutch Wonderland (Summer 1995) that I labeled these trains as "tube-type", since they look like five beer cans laid end to end on the track. The Philadelphia Zoo has the other type of UDL train; the "golf cart" [very scientific, I know]. These trains actually have eleven cars that look like 60's style golf carts hooked together and are open to the air on all sides, unlike the tube trains where one is enclosed inside the car. 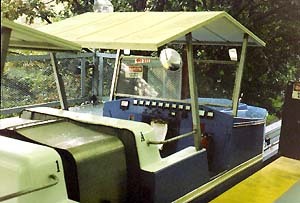 The Safari Monorail began service with three trains, in the obligatory colors: red, blue, and green. At one point in their history, zoo officials had to retire the green train, due to being run off the track at an open switch while attempting to get to the maintenance facility. (There's a long story behind this and propriety dictates we not discuss it in front of children and light rail fans; it was not a flaw of the monorail system. Let's leave it as "human error induced by anticipation of a mid-afternoon coupling--and not of two trains".) This train's cars sit beneath a building at the zoo awaiting repainting and re-installatin. The system did not enjoy a reputation for safety until recent years when a new maintenance staff was put in place. Bob Halpine, former General Manager of the system (for the concessionaire that runs the system), has described the difficulties he had in bringing the system up to safe standards. Some of Halpine's improvements to the system have included 7.5 horsepower motors to replace the stock 5 horse units that constantly stranded trains when they burnt out trying to negotiate the small hills on the track. The inspectors who certify the system for operation also required that the trains be retro-fitted with an automatic fire extinguisher system. The system runs in roughly a mile long circle with two stations at opposite ends of the park, appropriately named North Station and South Station. One would think that this would qualify the system for inclusion in the transportation section of this publication, but since there are times when it is used as a round-trip-only ride, we'll include it as a "novelty." On two separate occasions, I've tried to photograph and ride the monorail at the zoo, but both attempts have been futile. 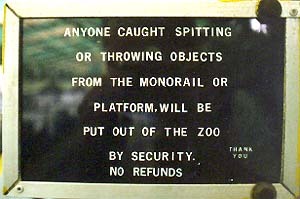 The first visit was in January of 1996 [during which season the monorail doesn't run anyway], on the day after the zoo's primate house was destroyed by fire. Understandably, after losing some of the zoo's primates, nobody was answering phones that day [let alone letting in a monkey with a camera!]. The second was in August of the same year with various TMS members and officials in attendance. We arrived on the monorail platform just before a moderate thunderstorm began its downpour. While waiting for the blue train to pick us up [I had convinced our party not to board the red train when we had the chance because no seats were available in the forward most or rear-most cars; the best location from which to take a picture of the train from the vehicle as it negotiates curves. ], the loader announced in a happy voice that they were all going to get to go home early. This monorail doesn't run in the rain! Foiled again! Now I have to make yet another trip to the Northeast, but with the discovery of several New Jersey novelty monorails [and the extension to the Newark International Airport monorail], there will be more reasons to go. Note: this monorail was removed in 2002.